A woman walks into a police station and tells officers she's been missing for eight years. She has no phone and no ID, just a piece of paper with a name on it- David Raker. Raker specializes in locating missing people. After his wife died, they became how he coped and moved on - and, almost a decade later, the disappeared aren't just his job any more, they're his life. So when the police call him, Raker agrees to meet the woman. But this is no ordinary case - and no ordinary woman. She looks exactly like his dead wife. She knows everything about their marriage, their history, even private conversations the two of them had. And soon, everything Raker thought he knew about his life, and about the woman he loved, will be exposed as a devastating lie . 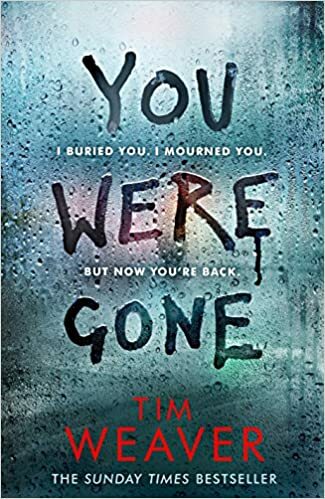 . .
You Were Gone by Tim Weaver starts with a great opening. David Raker’s wife – dead for 8 years – apparently arrives at a London police station. She insist the police get hold of David Raker. I’ve read all of Tim Weaver’s series of book on David Raker and I would advise anyone starting reading them to start with a much earlier book. However those who are fans will know just how affected by Derryn’s death David was. To go to the police station and see someone who claims to be here and who says she lives with him has a profound effect on him. She even looks like Derryn. It sets the scene for a story I think is outstanding in what is an excellent series. Initially I found it hard to see how this story could be sustained really. Alleged wife walks into police station, prove that she has died and is imposter, story ends… Nope – Tim Weaver is a far cleverer writer than that. The David Raker of You Were Gone is the same as he was before however someone is seriously messing with his mind. So often the phrase “psychological thriller” is used and often – for me – it isn’t true. Parts of this one are deeply dark and psychological and troubling for Raker and the reader. Throw in the fact that, in general, the Metropolitan Police are not fans of Raker and Raker is very alone. I’ve been a fan of David Raker since the first book I read over 5 years ago. He is one of my favourite characters without question. In You Were Gone Weaver digs even deeper into David’s psyche and to great effect. The other characters work well in their parts too. Some new ones appear and some old ones are still around. This is the usual standard of excellent tense writing. It’s pacey and twists well. Raker’s star rises and falls dramatically at times. It is a very well thought out book and well researched too. Tim Weaver’s penchant for old deserted places is put to good use again. Weaver is one of a small handful of genuinely favourite authors. He has not disappointed me so far and to my joy it looks as though this is not the last David Raker book. I’m inclined to say that this may be the best of the series so far – no mean feat in the 9th book of the series. I’d be fairly certain that fans will love. My review of the previous book in this series – I Am Missing – is here.